What can you do for Dementia Action Week 2018? Dementia Action Week 2018 will take place on 21st – 27th May. An initiative of The Alzheimer’s Society, the annual event encourages people to improve the lives of people affected by dementia and this year sees a change from it being called Dementia Awareness Week to Dementia Action Week. During the week people across the UK will be asked to unite and take actions – large and small – that will make everyday life better for people affected by dementia. Whether this is taking the time to reach out to someone with dementia for a chat, or rallying your local community to clean up a park to make it more dementia-friendly – every action makes a difference. Sue Sayers, our Senior Community Participation Worker with older people has been playing a big part in making our city of Brighton & Hove a friendlier place for those affected by Dementia. Her work has included developing a Dementia Friendly Toolkit for organisations to refer to and collaborating with other charities across the city as part of the Brighton & Hove Dementia Action Alliance. Sue is also an accredited Dementia Friends Champion – delivering training to help raise awareness and allow people to become “Dementia Friends”. 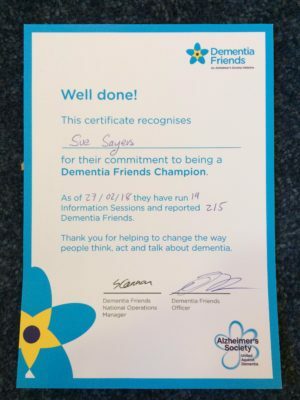 Sue had already made 215 Dementia Friends when she was presented with her certificate (see below) back in February and the number is growing every week. At the time of writing her count stands at 230 – contributing to the figure of over 2.4m Dementia Friends nationwide. The Alzheimer’s Society are aiming to have made 4 million Dementia Friends by the end of 2020. Sue told us about some of her recent work, saying “I am busy revising our Dementia Resource leaflet to make it bigger and better, up-to-date and comprehensive. You can find out about the launch of the Brighton & Hove Dementia Action Alliance on our blog, as well as reading stories of TDC’s other work with older people.